Friday was in the low 50’s. So I was adventurous and looked underneath my pine needle mulch to see find out if my garlic was there. Sure enough I saw a small green spike poking up through the soil. So I have, at least, one garlic plant for Spring. If we can get consecutive warms days they can stretch out of the soil. The seedlings are growing well. I had a few more pepper plants show themselves. 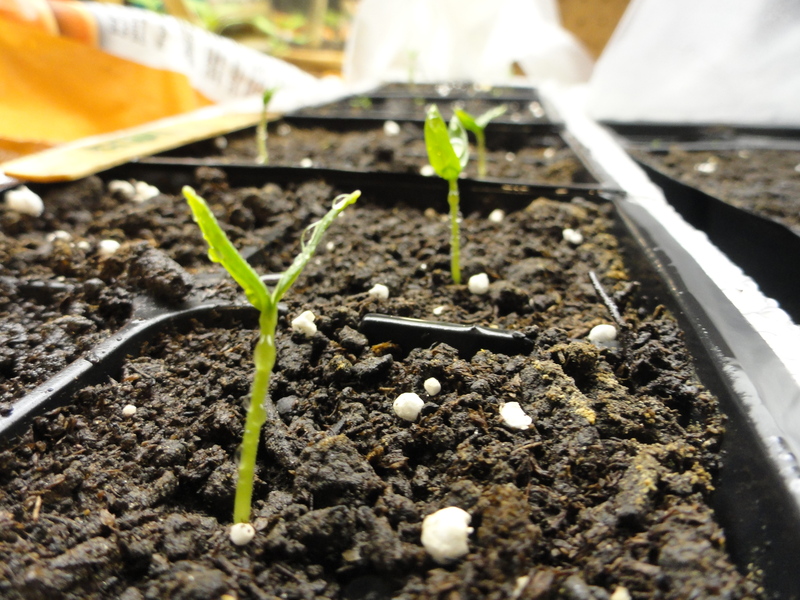 I have about ten pepper seedlings with more planted a week later. Last fall the thyme plants in the herb garden looked like they were struggling. I am not sure if it was my timing or the plants. Going through my seed packets I found I had a few thyme seeds that needed to be used. I figured the long and hard winter may have done in my thyme in the garden. I took the old seed and filled on cell in a four pack. 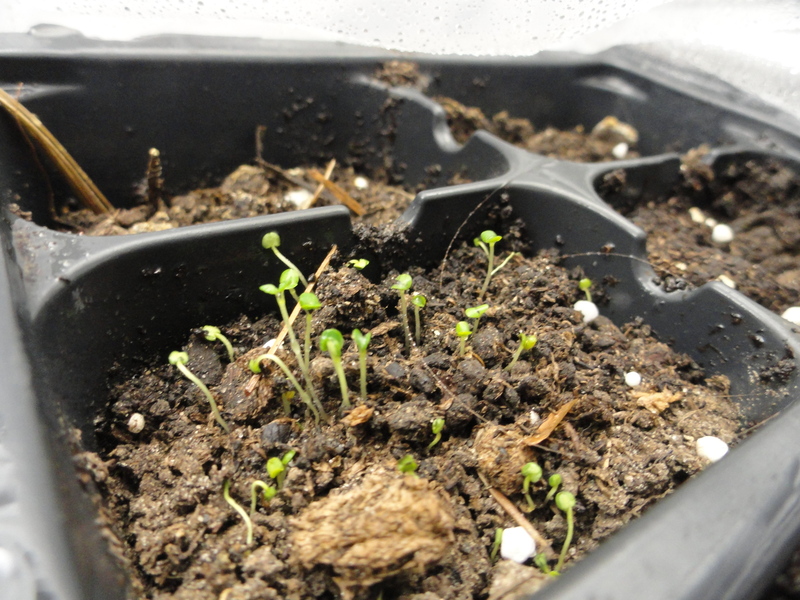 I did not expect the germination rate to be so high. In the other cells there are thyme seeds I purchased new this year. Will I have enough time for all my thyme? On our front porch we have a couple of hanging baskets. A friend has graciously given us flowers each year. Last year the flowers were impressive. Now we are just left with two hanging baskets. So I am experimenting with a variety of strawberries called “Gasana” from Johnny’s Selected Seeds. Gasana is an ornamental strawberry that works well in containers. It is day-neutral so it will produce small to medium fruits. If everything works. So my plan is to sit on the porch, read, and snack on strawberries. I have found it challenging keeping my seedlings watered this year. They are drying out quickly. 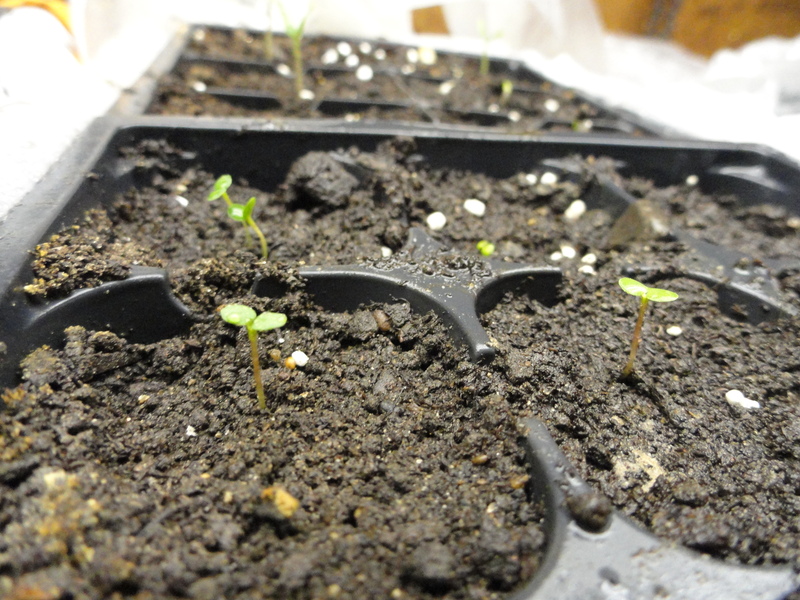 Heating from below really improves germination, but it makes it difficult to not dry out young seedlings. To challenge myself more, I have been starting seedlings at different times. So there are different needs all under the same light. I think everything is good now, but it has been challenging. What are you seed starting challenges? Enjoy this season, learn from last season, and look forward to next season. Time to get them started and cared for. Been doing a lot of traveling and am unable to care for them when I am on the road. Looks like most plants this year will be from purchased starts.